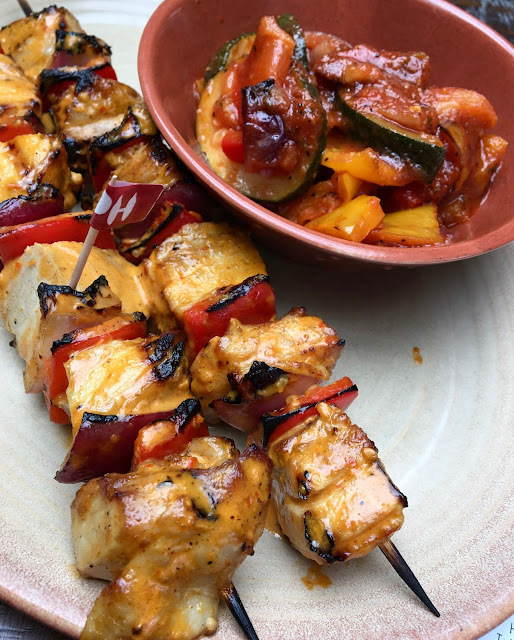 For a primer on allergen-friendliness of Nando's Peri-Peri, look to their website (click here), where the online menu features a key that indicates the presence of allergens as well as vegetarian-friendly options. The chicken, in every, form is gluten and dairy-free. You can chose from wings, thighs, breast, livers, legs, or if you are especially hungry, the whole bird. Chicken orders come with a side included. The only thing off limits is the "the cure" which includes french fries. Due to a shared fryer, those are off limits. Stick to the platters and avoid the sandwiches, wraps, and pitas, which are- of course- off limits. If you are gluten-free only and want a salad, opt for the nutty date salad or mediterranean, but both do contain dairy. All of the basting sauces are gluten and dairy-free. Finally, for dessert-lovers, bottomless frozen yogurt and coconut macaroons are gluten-free. The latter is dairy-free. Now for the review. When I alerted the staff member taking my order to my dietary restrictions, he handed me a book containing all of the allergens and nutritional facts for every dish on the menu. The chicken grill is gluten-free, as all of the chicken and sauces are gluten-free so cross contamination is definitely minimal. I ordered the 1/4 breast and wing with a side of coleslaw and added the cucumber and poppy seed premium side for the sake of taste testing. The chicken was tender and had a nice crisp skin. I normally am not a big bone-in chicken fan, but the meat was easy to to separate from the bone and was flavorful. I chose the lemon and herb sauce, which was flavorful, but I definitely could have used more of it because it really enhanced the tender juiciness of the chicken and skin. Of the two sides, the cucumber poppy seed salad was my favorite. The crunchy cucumbers were bathed in a vinegary dressing with pickled red onions. The tanginess worked well with the chicken's flavor. The coleslaw was also good, it just did score as many points as the salad. I liked the texture and freshness of the shredded cabbage and carrot, and the mayo definitely provided a cooling effect. If you choose a spicier sauce for your chicken, the coleslaw would definitely be a strategic choice of a side. 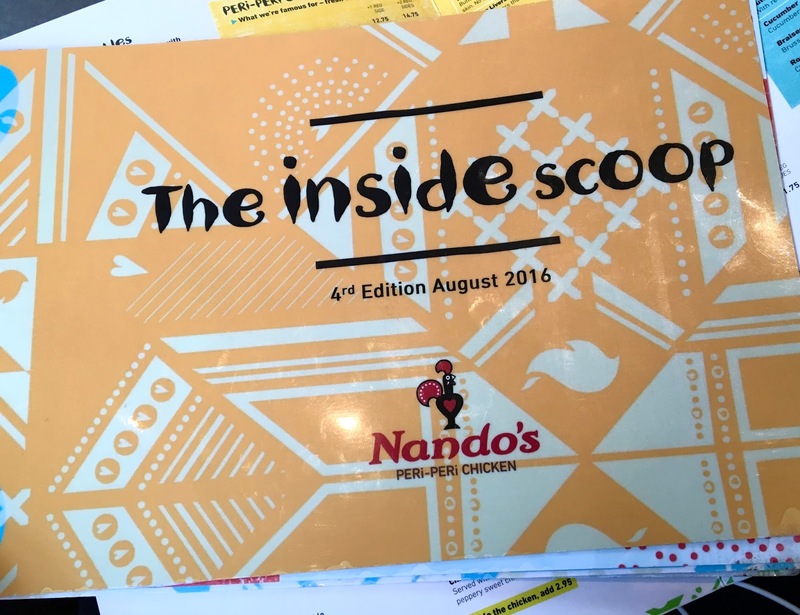 Overall, I liked Nando's Peri-Peri. The gluten-free friendliness is pretty high and for what I paid, I feel like I got a satisfying portion. 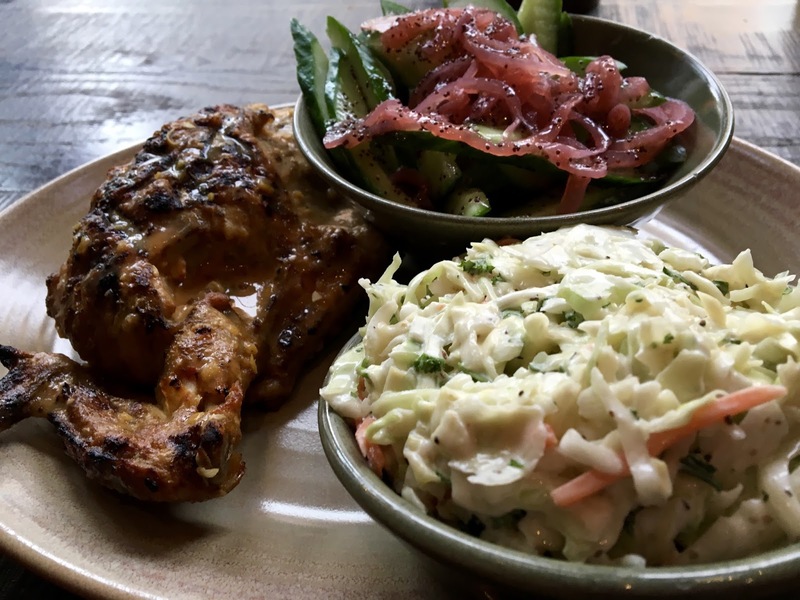 I'm not sure it will regularly frequent Nando's but it's definitely a good option to have on hand whenever I find myself near a location. Although Nando's Peri-Peri locations are predominately in the Maryland, Virginia, and DC area, they are operating and expanding in Illinois. Update 2/11/17: Almost a year after my initial visit, I decided to do a second visit, to see what if any changes there would be to the gluten-free menu. This time I visited the Towson, MD location, and was pleasantly surprised to find that they had an allergy "bible" on hand that listed out every menu item's nutritional value, including the allergens present. It was super helpful, and I felt much better paging through it to see my meal options rather than have to play 20 questions with the cashier to see what was safe. Once I ordered, the cashier then let the manager on duty know of my dietary needs so they could navigate the meal through the kitchen (which does handle bread). I ordered the boneless thigh skewers, with the hot sauce as my chosen marinade. The chicken is ridiculously tender and conveniently portioned into bite-sized chunks. Also on the kebobs are red bell peppers and red onions, which produce a nice taste/texture contrast. The hot sauce is certainly spicy, requiring multiple refills of my water glass to get through the meal. I have no complaints though, because I like super spicy food. As my side, I chose the primo roasted vegetables, which feature papers, onion, and zucchini in a stewed tomato sauce. The dish was flavorful and had a kick all it's own, which played with the spice of the chicken. The combination of the two put my tongue ablaze, but I was delighted. While I was a bit tepid on my first visit, this second one definitely has converted me to be an enthusiastic believer of the church of Nando's Peri-Peri. The ordering process was more transparent, I felt better about navigating the menu, and the food was absolutely exquisite. 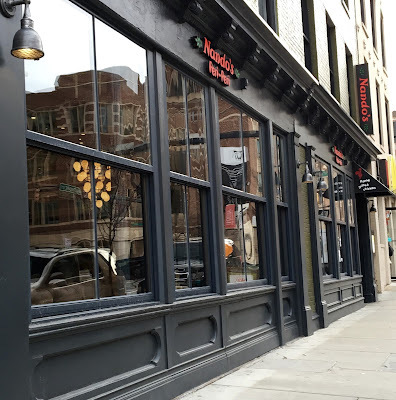 I will not wait a year until my next visit, and am thrilled to be able Nando's to the short list of fast casual options I can rely on for a safe and satisfying meal.